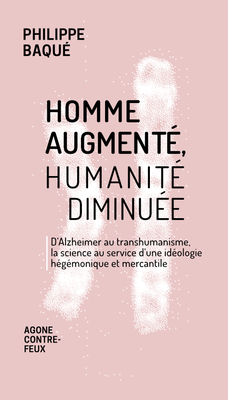 [Page 71] Jean Maisondieu, a psychiatrist and author of Crépuscule de la Raison, la maladie d’Alzheimer en question (Sunset of reason, Alzheimer’s disease in question), often claims that Alzheimer’s disease does not exist, but the Alzheimer’s patients do exist for sure. [Page 74] I reached the conlusion that patients are demented mostly because they were dying of fear, at the idea of death. The brains of Alzheimer’s patients might be altered, but these patients are mostly sick of fear. [Page 260] I feel the need to ask the question again: what is transhumanism? An economic and political lobby? A technoreligion? A new eugenic ideology? The biggest science fraud of the 21st century? Worth thinking about it… Is aging a disease? Is death a disease? This entry was posted in Innovation, Must watch or read and tagged Science on April 2, 2019 by Hervé Lebret.